This week, students in grades three through eight began the eMPowerME test, which assesses students in mathematics and literacy. Contrary to popular opinion, these tests are required by state and federal legislation. Unfortunately, this puts the school district at odds with certain parents who desire to opt their students out of testing. I know that I speak for every member of the staff and school community when I say that students have the potential for greater success when the school and parents work collaboratively to support student success. Just as we have made the decision to respect parents’ wishes about whether their children participate in the testing, it would also be nice if parents would understand the position that the school district is in with respect to the testing. In today’s world, unfortunately many people would rather express ideas in the court of public opinion (read: Facebook or other social media) rather than seeking to develop an informed opinion. As I said earlier, this testing is required. We, as a district, do not have the authority to grant an “opt out” for students, although we have made the choice to honor parents’ requests by not forcing students to take the tests. To say students aren’t required to take these tests is similar to the claim that there really is no speed limit. While we may not lose funding, that threat is just as real and possible as the notion that a police officer may only give you a warning for exceeding the speed limit by fifteen miles per hour. Not getting a ticket doesn’t mean there is no speed limit just like not taking the test doesn’t mean the test isn’t required. Sadly, when parents allow students to opt out of tests, it makes it impossible to use the test results in any meaningful manner. When all students participate, this gives individual parents an outside assessment with which to compare their child’s performance in the same way that the test allows the school district to evaluate the effectiveness of its programs and any potential areas of strength and weakness. When only pockets of students take the test, there is no ability to evaluate our programs and the performance of students. Additionally, while many parents have strong reasons about opting students out, many others do not. While I would never question the decisions parent make for their own children, when I hear that some parents are opting students out because the students feel the test is boring or because their friends aren’t taking the test, I wonder what such decisions teach students. In conclusion, I would encourage any parent with questions about the testing to contact his or her child’s building administrator to discuss the testing. Quite frequently, having accurate information about what the test is and what it isn’t may help to dispel certain perceptions that aren’t based in fact. I am hoping that by honoring parental requests and by maintaining open lines of communication that we can maintain a positive, collaborative relationship with parents, which is essential for student success. What the exact nature of the test will be has yet to be determined, so I will provide an update when things are clarified. In terms of the Smarter Balanced results, I have attached an overview of our District's results, which show how our students performed as compared to the rest of the State in grades 3-8. As we discussed with our Curriculum Sub-Committee, it is difficult to draw any conclusions based upon one year of testing. Compounding the issue is the fact that many parents asked that their students be excused from testing, which we made possible in an attempt to maintain positive relationships with families. However, when significant numbers of students aren't tested (roughly 40 at Molly Ockett, for example), it makes it impossible to draw conclusions. We are in hopes that the potential new agreement with Measured Progress will result in a consistent test that, when given over a number of years, will give us usable data to compare with our classroom results. It’s no secret that I’m an advocate for competency-based learning models. I’ve goneon the record lots of times as just that. I shared my thoughts on Montessori education as one of the original competency-based models and until very recently, I had two daughters who were learning in competency-based, montessori learning environments. This year our third grade daughter transitioned from the only formal learning environment she’s ever known–a no-grades, no-desks, pick-your-own-work Montessori classroom–to a gifted, STEM magnet in a large traditional urban school district. We really sweated the transition, but it’s been mostly a breeze for us and our daughter. She bounces off to school every day, even though she has to get up more than a full hour earlier. She dutifully and cheerfully does her nightly (much more challenging) homework. She tells stories about how funny her teachers are and every day she mentions a new friend. She’s learning new things in new ways and even described her new school as “more like a Learning Camp” than a classroom. In other words, all signs point to “happy, thriving, learning child.” So, why on earth did I let one grade, her first “C,” totally shift my perception of how she was doing in her new school? Coming from the world of no grades where we’d been living for the past five years, when I saw that “C,” everything engrained in my head about what learning looks like was telling me that my daughter’s first reading comprehension grade of a “C” spelled trouble – even though the “smart parent,” education researcher and competency-based learning advocate in me knew that wasn’t the case. So where does that leave me as a parent and where does that leave us as advocates for competency-based learning with one foot still firmly in traditional classroom structures – are we cool with the “C?” Yes, we have to be. This is especially challenging because in my estimation, no one has it perfectly right just yet. At least the purely competency-based, Montessori school she was in didn’t. In that environment, it was all individual progress without the broader context of developmental targets or goals. Because all progress (no matter the pace) was treated equally, we never had a clear picture of learning strengths or weaknesses. And that wasn’t good either. So, what did I learn from my daughter’s first “C”–besides the fact that she needs a little extra help with reading comprehension? I learned there’s a fair amount of “unlearning” that still has to happen before we will all feel comfortable in completely competency-based learning environments. As more and more schools shift from letter grades to levels of mastery, we would all do well to continue challenging the assumptions we all have about how we define and describe when learning is or isn’t happening. For more perspectives from parents who are facing challenges as they support their children in new learning environments, check out our latest book Smart Parents: Parenting for Powerful Learning available in paperback and ebook formats for Kindle, Nook and iPad. Share your stories about navigating learning with your kids using #SmartParents on social media. Carri Schneider is Director of Research and Policy for Getting Smart. Find Carri on Twitter @CarriSchneider. On this, the first day of spring (even though it feels far from it), I hope everyone is doing well. In addition to lengthening days, this time of year is also budget-development time. At last Wednesday's Board of Directors meeting I gave a presentation covering the highlights of current work, including an explanation of current work on the new-school project as well as preliminary information related to the budget. I have attached those slides to this post for your perusal. At last month’s school board meeting, I gave a presentation on the district’s responsibility with regard to the Common Core Standards. This was an attempt to clarify some comments made at the November meeting by members of the public who suggested that the board should simply vote to jettison these standards. I have attached the slides from that presentation for anyone interested in more information. To summarize my thoughts as presented at the board meeting, most of our work during the past few years has focused on how to make learning relevant, engaging, and appropriate for our learners. While the standards we have to use as benchmarks are standardized, we still maintain the autonomy to utilize a variety of instructional and assessment methods to bring the standards to life. Students should ideally have many choices in determining how they demonstrate what they have learned. Our focus has been and will continue to be on the individual learners inhabiting our classroom and on trying to meet those individual needs to help each student become successful. Given just how unique students are in terms of their interests, knowledge, skills, support systems, etc. I applaud the yeoman efforts our teachers make each and every day to help support student learning. I found the following article to be worth a read. I hope you find it equally as interesting. "Homework time!" The response from my two older children comes together in a small symphony of nods and groans. And it's here in this moment I have to admit -- I'm not sure what to think about all this. It's one of those things that I have to gear up for. Some parents feel that being in close proximity and proactively helping a child with homework is the best way to do it. They feel it's not okay to give the answers, but rather they try to act as a supervisor. The key here is to stay close -- then check the work together when the child is completely done. Other parents believe that setting up discipline and independence is the most important role of early homework. In this case, a parent helps to choose a consistent time and work place for homework, reviews the assignment with the child, and then leaves her alone to complete the work. If the answers are wrong, then teachers know what to work with her. And then there are those parents who think homework is the ultimate evil and inappropriate for that young age. They do everything they can to help the child finish their work so the child can play, sleep, or do whatever they need to do after school. Honestly, I seem to shift between all three of these methods. But how can I relate to the situation in a way that most benefits my children so they have the greatest self-esteem, confidence, and most importantly, positive engagement in their own learning? Homework is a reality for my children, and I think the best pathway for me is to recognize what my kids can get out of the process and to support their work time with those goals in mind. So what are the possible benefits of homework for younger children? 1. It helps to establish a commitment and routine. I think this is probably the most essential role of homework for young kids. And I know that if I can help my kids establish their routine, that skill will serve them for the rest of their lives. In this case, I can get them started and help create space for them to work, but then let them be. I can help them understand that getting answers incorrect is all part of the process, but not trying is not okay. 2. It helps them to be more engaged in learning. It does seem that there are opportunities for engagement that are specific to home. When my kids do their work at home, they can go at their own pace. They can talk with us about what excites or challenges them, and we can find ways to continue the lessons through our day-to-day life. One of the great benefits of homework is to keep parents engaged in what kids are doing. Knowing that your kids have homework and what the expectations of the teachers are on that homework is important. As kids get older you may not know every piece of homework they do, but you should have some sense of teachers' expectations for your students work. However, parents are not supposed to do kids homework. Being engaged in it vs. doing it are two different things. Just because you're involved doesn't mean you should do your kids' work for them. It all seems to come down to the idea of partnership. First and second graders are just starting to read fluently and learn basic math skills. They certainly need help packing their lunch and their school bag. Perhaps homework is part of that routine as well. I do feel that as a parent, I am here to give support and help, especially when my children are so young. As time marches on and their reading comprehension and number dexterity matures, I think I'll be able to back away. But for now, given their age, I'll stick with my gut. I'll take out their assignment, grab them a pencil and say, "if you need my help, let me know." And then I'll pull up a chair, open my computer and do my work right next to them. Now, put kids' homework and school books back in their knapsack. Check. If schools truly want to engage students, they need to downgrade control and compliance—and upgrade autonomy. Daniel Pink, author of Drive (Riverhead, 2009) and A Whole New Mind(Riverhead, 2006), has looked at four decades of scientific research on human motivation and found a mismatch between what science tells us and what organizations actually do. In this interview with Educational Leadership, Pink shares his insights on how schools can create more optimal conditions for learning—and how they can dial up students' own motivation to learn. People often rely on external rewards to get kids to do something—a school rewards a class if the students score proficient on a test; a parent rewards a child if the child gets all As. What's your take on this? My take is what 50 years of behavioral science tell us. There are certain kinds of motivators, what I call "if-then" motivators, as in "If you do this, then you get that." Those motivators, science tells us, are pretty effective for simple, short-term, algorithmic tasks. But if-then rewards are far less effective for more complex, creative tasks. The problem we have in schools and organizations is that we tend to use those if-then rewards foreverything rather than for the areas in which they work. Trouble is, in both the workforce and education, people now rely less on these routine kinds of skills and more on work that requires greater judgment, creativity, and discernment. In many ways, how we motivate people hasn't caught up to the reality of our times. Now, let's be clear. We all love rewards. If you dangle a prize in front of people, it gets their attention, but—and here's the important point—it gets their attention in a narrow way. That's OK for certain things—for example, if you're stuffing envelopes or turning the same screw the same way on an assembly line. Rewards for things like that can actually improve performance. But if people have a completely narrow view of a task that requires more creativity or judgment—designing a new piece of software, inventing a product the world doesn't know it's missing, and so on—then they're not going to do as well. What's more, this carrot-and-stick approach confuses two types of goals. Research by Carol Dweck and others has shown that there's a difference between learning goals and performance goals. A learning goal is, "I want to master algebra." A performance goal is, "I want to get an A in algebra." The research shows that reaching performance goals doesn't necessarily mean that you have hit a learning goal. If people are single-mindedly focused on performance goals—and they achieve them—it doesn't mean they've learned anything, improved their capabilities, or mastered something complex. The kid is less likely to retain what she learned to get the A, less likely to persist when the going gets tough, and less likely to understand why algebra is important in the first place. However, if a kid is single-mindedly focused on a learning goal—mastering algebra—chances are he's going to do pretty well. In the process, he'll probably attain that performance goal and get his A. So it's best to simply go for the learning goal and use the grades and scores as feedback as the student works toward mastery. In your book Drive, you wrote, "While complying can be an effective strategy for physical survival, it's a lousy one for personal fulfillment." Nevertheless, people spend a lot of time complying in school. What needs to change? There's a huge difference between compliant behavior and engaged behavior. With compliant behavior, you're doing what someone told you to do the way they told you to do it. There's nothing wrong with that, but it's different from engagement. With engagement, you're doing something because you truly want to do it, because you see the virtues of doing it. Now most good teachers don't want compliant students—they want engaged students. It's more fun to teach engaged students; it's kind of dreary to teach compliant ones. Human beings, whether they're 6-year-olds in a 1st grade classroom or 46-year-olds in a corporate boardroom, don't engage by being managed or controlled. We engage by getting someplace under our own steam. So if we really want engagement rather than compliance, we have to increase the degree of autonomy that people have over what they do; over how, when, and where they do it; and over whom they do it with. Students don't have a lot of autonomy in school—but neither do their teachers. Many trends in federal policy, especially over the last decade, have focused on constraining teacher autonomy. Now when I say that autonomy leads to engagement, it doesn't mean that you have to turn the autonomy dial up to 10 in every circumstance. If you really want to get people engaged, you have to find ways to increase autonomy the right amount at the right moment. Now what does this mean in practice? It means not having a system that requires that every 3rd grade teacher everywhere in the country on the second day of March is teaching the exact same thing in the exact same way. That's a disaster. What it means in terms of students is giving them some discretion over what they study, which projects they do, what they read, or when or how they do their work—just upping the autonomy a bit. We're not talking about a wild and wooly free-for-all where everyone does whatever they want whenever they want to do it. What I am suggesting is that our default assumption, for both students and teachers, should be this: Let's trust people with autonomy instead of assuming they can't handle it. But here's the challenge: At some level, compliance is a lot easier for the people at the very top of an education system. It's a lot more convenient if you have compliant teachers and compliant students. And management is all about getting compliance. Even if you sand off the rough edges and oil the gears, the technology of management is still designed to produce compliance. We need something different—something beyond management, whatever the next iteration is. We need leaders, both in organizations and in schools, who create an atmosphere in which people have a sufficient degree of freedom; can move toward mastery on something that matters; and know why they're doing something, not just how to do it. And this leads to another challenge, an uncomfortable question for legislators, governors, and presidents: Are our education policies designed for the convenience of adults or for the education of our children? Take high-stakes testing—it's easy, it's cheap, and you get a number, which makes it really convenient for adults, whether they're taxpayers or policymakers. But is heavy reliance on punitive standardized tests the best way to educate our children? Probably not. Doing what we truly need to do for our kids is going to end up being pretty inconvenient for a lot of adults. But to my mind, it's the only way to go. Some organizations use what you call Goldilocks tasks to increase their employees' opportunities for mastery. How does this work? Goldilocks tasks are ones that are not too difficult and not too easy. If a task is too easy, people—whether they're children or adults—will get bored. If it's too hard, they'll get anxious or frustrated. You want that sweet spot, where something is within our range of challenge—not too easy, not too hard, but just challenging enough that we're engaged and being pushed to a slightly higher level. Those moments are some of the most optimal experiences in human existence—what Mihaly Csikszentmihalyi called flow. In flow moments, we lose a sense of ourselves, we're in the moment, and we're deeply engaged. We need to create more of those moments in school. If you're doing something easy, you're never going to improve; if you're doing something too hard, you're not going to succeed, so you won't improve that way either. But if you have a Goldilocks task, you're much more likely to move toward greater mastery. The problem is, the degree of standardization in school works against Goldilocks tasks. What's going to be a Goldilocks task for me isn't going to be a Goldilocks task for you. What's more, I may need a more challenging Goldilocks task in algebra than in Spanish. Standardization is an extremely blunt instrument: The work is going to be too easy for some people, too hard for others, and a Goldilocks task for only a few. The whole world is awash in customization—until we get to the schoolhouse door. That cuts against what social scientists know about how human beings learn and improve. Now I understand that differentiation is difficult to do. But let me give you a heartening example. One of my daughters had a math teacher who gave different homework to his students. The homework wasn't so fully customized that Fred had something totally different from Maria, who had something totally different from Eduardo. The teacher simply understood that the kids had different levels of understanding, so they needed different work. There was almost never one single homework assignment for everyone. I think that's the way to go. The question is, are we willing to devote the resources to that? Teachers would probably need to have smaller class sizes, which is more expensive. They'd need more time to develop not only lesson plans but also some degree of customization, and that requires time and resources, too. Few people would disagree that we need a greater level of customization in curriculum and learning. But we run into that problem again—it's inconvenient for adults! It requires more work and more money. So we come back to that question again: Are we creating education policies that are actually good for kids—or simply convenient for adults? You write about the importance of building mastery—and that one way of doing this involves turning work into play. How can organizations do this in a more substantial way than just reducing a task to a bunch of "fun" activities? Take math. It can be fun if you're dealing with a Goldilocks task. Your teacher is guiding you through, and you're getting sufficient feedback. That's what I mean by fun and play—we're actually talking about flow and engagement. The trouble with the word play is that it seems to connote a lack of rigor. We want things to be rigorous, certainly, in our education system. But it's possible for things that seem, on the surface, to be play to be absolutely rigorous. No one would think that a basketball team that's practicing to improve or an orchestra that's playing music isn't doing something rigorous. Take the work of scientists. Research shows us that a lot of discoveries were made when people had more playful mind-sets. In 2010, a pair of scientists won the Nobel Prize in physics for isolating a material called graphene, the thinnest, strongest, most conductive material in existence. They did this work during what they called "Friday evening experiments," a regularly scheduled two or three hours apart from their regular work hours when they just tested out stuff they thought was cool. They ended up making one of the greatest breakthroughs in material science in the last 50 years, basically during a physicists' recess. We need to take more of this into our classrooms. It's less loosey-goosey than it seems. Rigor and playfulness pair much more smoothly than we think they do—and that pairing can have some pretty spectacular results. You note that satisfaction with one's work often depends on hitching one's desires to a cause larger than oneself. What might this look like in school? Let's look at this from the point of view of teachers and then from the point of view of students. Most teachers go into this profession not because they want to make a pile of money, but out of a sense of purpose. But once they're in the profession, they often don't talk much about it. Teachers need to bring that sense of purpose to the surface. They should talk more about why they went into teaching, why it matters, why they're making this contribution to the world. This idea of purpose as motivator is not a touchy-feely sentiment. A pile of evidence during the last 10 years shows that it can be a real performance enhancer. As for students, research has shown that people do better at a task—whether that task is spelling, hitting a curve ball, or playing the viola—if they know why they're doing it in the first place. School is often all abouthow—here's how you do a quadratic equation, here's how you write a five-paragraph essay, here's how you do a paper chromatography experiment in chemistry. The fact is, we often give short shrift to why. Why are we doing this in the first place? Why does it matter that we solve quadratic equations? The simplest, most effective performance-enhancing tip for any organization is for the people in charge, whether they're teachers or principals or corporate managers, to have two fewer conversations in a given week about how to do something and two more conversations about why they're doing it. Of all the steps we've been discussing, this is one of the easiest things we can do. Responding to the "why" question is especially important for kids. When kids ask, "Why are we doing this?" we often dismiss it as an annoying question when, in fact, it's a pretty darn good one. And we need to be able to answer it—not to placate the kids, but because there's a rich body of evidence showing that when people know why they're doing something, they do it better. And I don't mean a weak why, like "because it's on the test." Teachers can most likely come up with a good reason why a student needs to learn something. And if they can't, then it really raises the question, should you be teaching it in the first place? Let's say a kid is studying statistics and probability, and she asks, "But why do I need to know this?" You could say, "Maybe you'll grow up to be an investor—or at least, you may decide to invest your own money in things—and if that's the case, you'll need to know this." And maybe the kid will balk and say she's not interested in that. Come back with something else. You might say, "You know, in order to make sense of your own life as a citizen, you need to understand something about statistics and probability. For example, when politicians use statistics, you'll need to be able to assess whether they're trying to deceive you or enlighten you." No matter the profession, kids are going to need to be proficient at analyzing things. Teachers are a case in point—to make sense of test scores these days, you need some notion of statistics and probability. When my older daughter first started doing homework, she would ask me why she had to do it. I remember saying, "Oh, just be quiet and do it." So what I'd like to see is something I haven't done enough of. I'd like for kids to hold adults' feet to the fire and insist they explain, "Why are we doing this stuff?" In your book To Sell Is Human, you suggest an intriguing technique for tapping into people's inner drive to do something that, on the surface, they don't seem to want to do. Can you explain how this works? It's called motivational interviewing, and it comes from the therapeutic world. Mike Pantalon from Yale came up with an enormously effective two-question technique. Let's say a student isn't doing his algebra homework—not because he's bored or because it's too difficult for him, but simply because he doesn't feel like doing it. As a result, he's not mastering algebra. You could say, "Daniel, on a scale of 1 to 10, how ready are you to do your algebra homework?" He might say, "Well, I'm a 2." Our instinct is to respond, "Hey, what's wrong with you?! Come on, you should be a 9!" Instead, the follow-up question in this technique is, "So Daniel, you said you're a 2. Why didn't you choose a lowernumber?" That question always throws them. Daniel has to explain—maybe for the first time in his life—why he's not a 1. He might say, "Well, I know that in the long run, if I don't get this down now, I'm going to be in big trouble in math. Also, although I'm not sure what I want to do later on, I've thought about going into engineering or medicine, and maybe if I don't master math, I won't be able to do that." Daniel begins to articulate his own reasons—not yours or mine or the teacher's—for doing something. When people have their own reasons for doing something, they believe the reasons more deeply and adhere to the behavior more strongly. And that's what we want to draw out. The only way Daniel is going to be engaged rather than compliant is if he has some degree of say. This questioning style—rather than the hectoring, demanding, commanding style we often default to—can be very effective. Now here's the thread that connects all these questions. As parents, as teachers, as entire organizations, our instinct is toward greater control. We think control is going to make something better. But people have only two reactions to control: They comply, or they defy. We don't want defiant kids, but we also don't want compliant kids. We want kids who are engaged. If you truly want to engage kids, you have to pull back on control and create the conditions in which they can tap their own inner motivations. Many of us have heard the expression, “Too much of a good thing is bad for you”. It is no wonder that when people, groups, or organizations take things to the extreme, that misconceptions come about. Additionally, not every person is acquainted with every other person’s work. For example, I don’t know everything that a doctor does, so therefore, if the doctor is prescribing a lot of medication to patients, it may or may not be warranted, despite what my perception is around prescribing the medication. Assessment is no different, and honestly, to some degree, standardized testing has earned itself a bad name. I’m not saying that I am a huge supporter of these types of tests, but with anything, they have their place and I suppose if utilized appropriately, could have some added value. For the general public, there is clearly not enough understanding about the types of assessments that provide educators information about student performance. Perhaps that is the first place to start. Summative assessments have been likened by some educators, as an “autopsy” because of the finality of their administration and results. These types of tests, like so many high stakes state tests, often times are administered near the end of the year and by the time the results come back, do not offer educators a lot of time to go back and reteach or change instruction. Generally, these tests are for policy makers, who use the results to drive policy. Now, for some districts and states, these tests take up a small amount of time and schools work hard to use the information garnered from them to change instruction for the group that had taken them and also determine what they may do differently regarding instruction for the students coming to them. Other states use as many as 30 days to administer state driven tests, which seems to be the extreme and erodes from the amount of teaching time that classroom teachers have to engage with students. Formative assessments, on the other hand, are likened to “check ups” because they are periodic, not final in nature, and provide teachers and instructors the opportunity to check in on student understanding and change the nature of their teaching before finally assessing students. They provide more opportunity for teachers to determine where students have clarity, and where they have gaps in understanding. Additionally, these formative assessments also are much shorter in length, and can be done quickly in the classroom with the teacher or team of teachers using results to quickly adjust teaching so to affect learning outcomes for students. Universal screening tools are just that; screening tools. They provide an indicator that something might be needed on behalf of the student to help them be more successful. 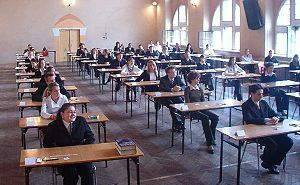 They are quick in nature, and usually administered across groups of students to determine if further probing may be needed. Some of these tools may be used to “progress monitor” children to see if changes in instruction produce changes in student learning. 1. States need to be sure that their curriculum frameworks are at the LEAST, aligned to those national standards that have been designed to help students meet with success after leaving school (K-12). 2. School districts need to review curricula and ensure that they are not only aligned to state and national standards but that they are rigorous and engaging for learners. 3. Leaders in schools need to ensure that the district curricula is not only taught, but that structures are in place for those students that do not meet the standards, so that they have an opportunity to be retaught in a way that helps them reach the standard (RTI). If the above three things happen, then in fact, teachers are teaching to the standards, which students should have mastered and then they are only needing to have some teaching around test taking strategies. In the end, it really isn’t about the test, and I wouldn’t advocate teaching to one either. Additionally, that test is just one snapshot of a student’s performance and therefore, the formative assessments a classroom teacher gives, if aligned to the standards, shows a student’s performance over time and may indeed show a more robust picture of what kids know in regards to the standards. Districts and states need to be smart about balanced assessment systems and not lose sight of the teaching that needs to take place with students. That teaching does not only mean academic standards, but citizenship, pro social skills, and all of the other teachable moments that help our students be well rounded, global citizens. While many of us may not like standardized tests, good practices help ensure that they aren’t the “standard” of how we assess our children on a regular basis. The following article provides some good food for thought as we think about how to best meet the needs of ALL students. Those are the closing words Garrison Keillor spoke each night on his radio show A Prairie Home Companion. He was summarizing the fictional hometown Lake Wobegon – a special place. It’s an interesting concept – this idea that “all the children are above average” and, I believe, can be a detrimental one when viewed through the lens of government-mandated testing. From No Child Left Behind to the Third Grade Reading Guarantee, from OTES to PARCC Assessments, these Federal and state mandates share a common theme – all expect our children to be above average, by their standards. Our federal and state policy makers expect all children to perform at a specific level. It’s a model of educational conformity at its finest. The “ideal” of what each child should be able to achieve. Here’s my problem – children aren’t widgets. Lake Wobegon, as wonderful as it sounds, is fictional. Each child we have the blessing to educate is unique. Each child, as I recently heard from education thought leader and bestselling author Sir Kenneth Robinson, “is a fountain of possibilities.” The young people in our schools can’t be considered to be outputs. As educators we must cultivate the right conditions for learning; we must find each child’s passion, talent, and creativity. As educators we must capitalize on the great diversity in our schools and guide young people to find their talents with an eye toward using these to positively contribute to society. I am not opposed to accountability or assessments; I believe we should continually assess students on individual progress. I believe data is essential in directing instruction and evaluating performance. Statistical analysis is necessary at a classroom and building level. I also believe that we must take individual differences, developmental differences, and life experiences into account. There is no – none, zero, zilch – assessment that can accurately assess all children. There is no one-size-fits-all test, fix, or easy way to measure student academic performance. It is difficult, challenging and messy work. We must abandon the idea that we can fix education with more money, a new program, and a piece of legislation. You can’t legislate learning any more than you can legislate love; learning is organic, it happens when passion meets opportunity, when a great teacher creates an amazing experience for students to embrace. Let’s commit ourselves to the monumental challenge of making educationpersonal for each child. Let’s tap into the passion, talent, and drive of parents, communities, and our dedicated educators nation-wide and explore every opportunity to motivate each individual student in our care. We must celebrate our diversity – the amazing differences in background, experiences, talents, abilities, and beliefs – and capitalize on opportunities to prepare each student for success after public education. We know we need a diversified workforce to drive our economy. We don’t need every student to be the same; we need every graduate to have skills, passion, and desire to be ready for productive lives as adults. Each child is gifted in some unique way; each child has a passion, each child is creative, and every student in our schools deserves the opportunity to write his or her own compelling and engaging success story – utilizing a unique voice no government mandate or standardized test could possibly measure. All of our children are above average . . . just not in the same areas.